The Coast region of British Columbia extends from what mainlanders of BC refer to as "The Coast" - meaning Vancouver BC area that borders Washington USA all the way past Vancouver Island, Prince Ruper and the Queen Charlottes and up to the Alaskan Pan Handle. It not only includes mountainous regions such as the Coastal Mountains but also rain forest areas as well as over 40 000 Islands of all sizes. The most popular Islands being Vancouver Island, The Gulf Islands and Haida Gwaii (Queen Charlotte Islands). So come explore and discover the British Columbia Coast while you Camp for Free! 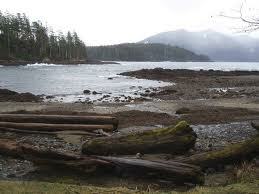 Cone Head is a recreation site in the Haida Gwaii region of British Columbia with 2 campsites that are free to camp at. Access is by road. Enjoy the Beach, Camping, Caving and general Nature Study. “Haidi Gwaii: The Queen Charlotte Islands” written by Dennis Horwood has a plethora of information on the area. You can read part of the book that discusses Rennel Sound and get more information about the area by following the link above. There are no flush toilets or reservations. Enjoy the adventure and please post your comments and pictures below.